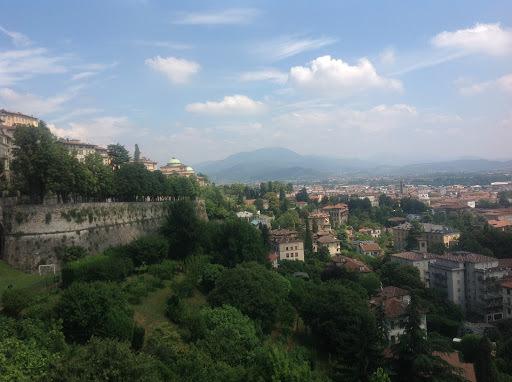 I wanted to plan a day in Milan that we would be able to take it easy and I thought a nice little day would be a trip to Bergamo. Bergamo is very easily reached from Milan, in fact on previous visits I have actually had my accommodation based in Bergamo. Bergamo is a cute little medieval town which has two centres, the citta alta (upper city) and the citta bassa (lower city) which was connected by a funicular. Tickets to Bergamo were not available online to prebook so they were the only train tickets that I bought on the day. It was very simple to buy them because, like most train stations, Milan has ticket machines that has an English option. 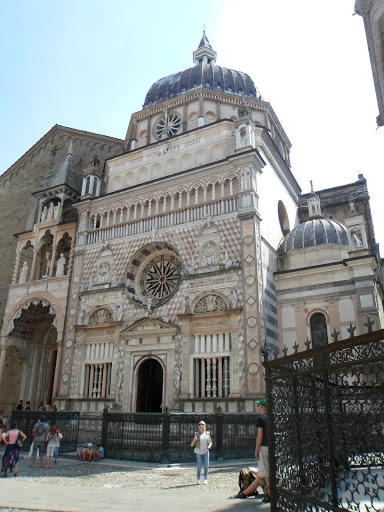 We were able to have a major lie in and made our way to Bergamo about noon. 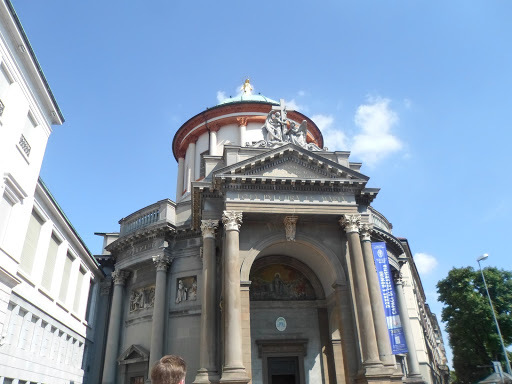 We ended up spending about 5 hours in Bergamo, just lazily strolling around. It was a hot day, about 32 degrees, so our short time there kinda exhausted us. When we arrived we took the funicular to the upper town as that is really the historical centre and also the place to grab some beautiful pictures from. The funicular is really easy to find, being at the end of the central street and the tickets can be bought from the office outside. We had a bit of a wander around but as I mentioned previously, it was warm and walking around the Citta Alta does involve a lot of hills. We were soon ready for lunch! We stopped at Bar Botticelli, which was right outside the funicular stop. 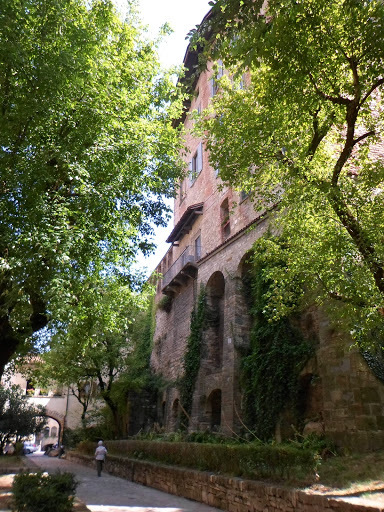 They had a nice outside terrace and they had a ‘Bergamo tasting menu’ which appealed to me. The service was a little slow but it was no problem as we were happy sitting outside, people watching. For 19 euros I got a large bottle of water, a glass of local red wine, a selection of local cheeses and meats, 4 cheese polenta, beef & sage ravioli and a slice of sweet Bergamo pie. Adam just had a cheese flatbread type thing then massively regretted it as he saw all my stuff come out. Everything was great except I wasn’t a big fan of the pie. It tasted a bit like bread and butter pudding, Adam ended up finishing it for me. 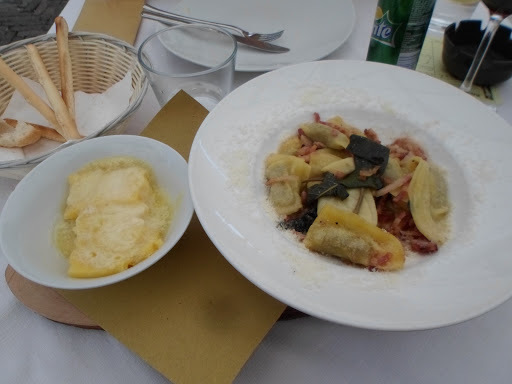 I was pleased to be able to find some polenta, the speciality of Bergamo. We then went back down to the lower town, we were pretty exhausted so we just grabbed some ice cream and headed back. We stopped at Grom, my favourite chain of ice cream shops. 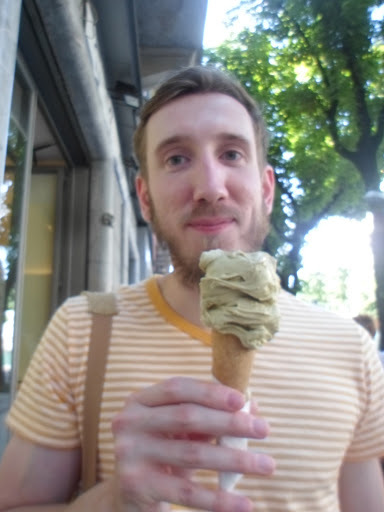 Adam got pistachio ice cream in a cone whilst I got some biscuit and pastry ice cream in a cup. The heat meant Adam’s ice cream almost instantly melted all over him, his shoes, his hands. I had to bring out tissues and a bottle of water to clean him up. We got back to the hotel, freshened up and got ready for dinner. The previous night we had a mad craving for crisps so Adam had gone for a little wander and noticed a street that he said looked as if it contained some good restaurants. We thought we’d check it out and ended up going to ‘Polpa burger trattoria’. It was a modern looking build-your-own burger place and it was fantastic. You placed your order before you sat down, they had full English menus as well. Adam selected one of their premade type burgers whilst I made one with turkey, gorgonzola, asparagus sauce and a fried egg. We both said the meal was bloody delicious so it was a brilliant find by Adam.